Here is the Brentwood coffee table. Made by the Amish of solid oak, just like the rest of the Brentwood line, this table will add tons of storage to your living room. What looks like 4 drawers is actually 2 hinged doors, just like the bottom door on the matching commode table, that open up to allow you to use the entire inside for storage. 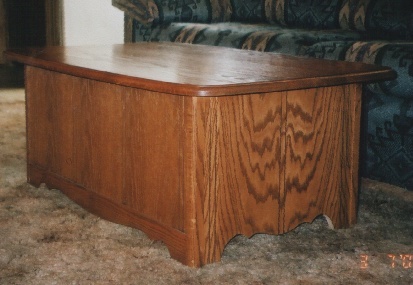 The coffee table is shown in a darker oak stain color - you can compare it to the lighter color of the end table and the cherry finish on the commode. Combined with a combination of our commode or end tables, the coffee table will be the perfect centerpiece of your Brentwood living room collection.